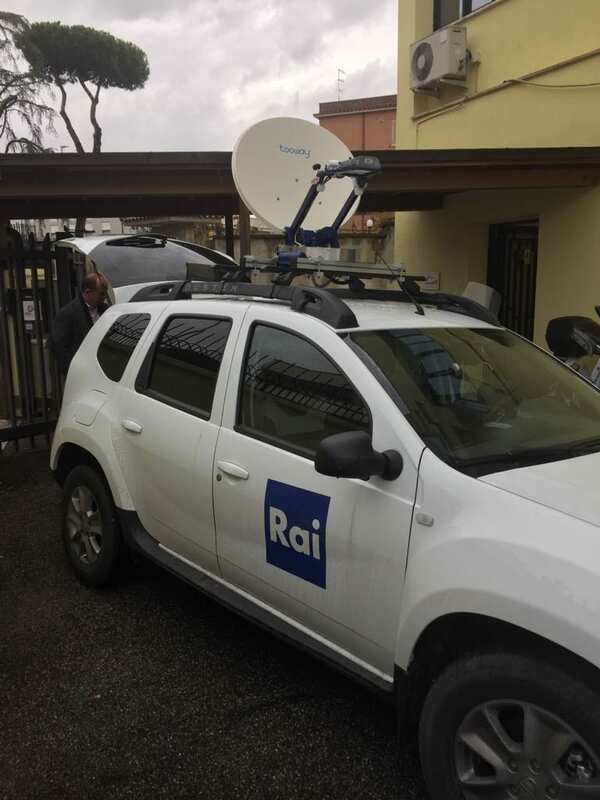 ABonAir announced today that Rai, the biggest television broadcaster in Italy chose ABonAirs’ wireless systems to be integrated inside their KA-SAT mini-van, for its news gathering and event coverage operations, all over Italy. As Rai wanted to be the first to bring live news at no time, it looked for a solution that will allow it to arrive quickly to scene and go on-air with automatic set up of the wireless system at the highest video link quality. Another requirement for the system was to fit into a small news car with cameraman and reporter only, which means a very reliable system that, can be easily operated by a single person. Rai published a tender for the supply of wireless broadcast systems and their integration in the mini-vans together with other video equipment. To carry out the project for setting up 8 KA-SAT mini-vans, Rai chose Video Projetti s.r.l., a prime System Integrator company in Italy. As their video equipment for live broadcasts, Rai chose ABonAir’s AB407™ wireless microwave transmission solution. The AB407 is a compact, lightweight and a robust system, comprised of a portable Transmitter and Receiver. It can be easily deployed and fits into any small OB-van. It is packed with premier features and capabilities at an affordable price. With a coverage range of 750 meters at a variable bit rate, controlled by the user, the AB407 enables broadcasters to “cut the cord” and add agility and mobility to their live broadcasts. The AB407 utilizes H.264 CODEC which ensures accurate frame encoding at high speeds and excellent picture quality. Every pixel is acknowledged thanks to a bi-directional radio channel between Transmitter and Receiver. Here is what Andrea Cafasso, mobile system engineer at Rai satellite production systems says about the ABonAir system: “We work now with the ABonAir system that just fitted to our needs. It allowed us to get to the scene and deploy quickly. Set up was very easy and quite intuitive. Just plug and play. Within minutes we were on air with a good picture quality and news was at our control room”. ABonAir’s CEO, Mr. Eran Igler, said: “We are proud to be chosen by Rai to provide them with a solution that fits exactly tier needs. The systems proved themselves in the field under any weather conditions allowing RAI to quickly deploy and transmit live broadcast from every corner in Italy”. Rai – Radiotelevisione italiana S.p.A. is the national public broadcasting company of Italy, owned by the Italian Ministry of Economy and Finance. The RAI operates DVB and Satellite television channels as well as radio stations, broadcasting via digital terrestrial transmission (15 television and 7 radio channels nationwide) and from several satellite platforms. It is the biggest television broadcaster in Italy. RAI broadcasts are also received in neighboring countries, including Albania, Bosnia and Herzegovina, Croatia, Malta, Monaco, Montenegro, San Marino, Slovenia, Vatican City, Switzerland, and Tunisia, and elsewhere on cable and satellite. In 1950, the RAI became one of the 23 founding broadcasting organizations of the European Broadcasting Union. Video Progetti S.r.l. is a leading Italian company which has been working for over 20 years in the distribution and integration of professional equipment for television, cinema and telecommunications. Having offices both in Rome and Milan, Video Progetti is constantly in touch with the key players in these fields and participates in the development of the broadcast industry by offering the most up-to-date production technology. Video Progetti is an integral part of a global distribution network for some of the most respected brands. Video Progetti deals efficiently with every aspect of broadcasting project from planning stage to completion. In addition, Video Progetti supplies a wide range of products and solutions for post-production houses.